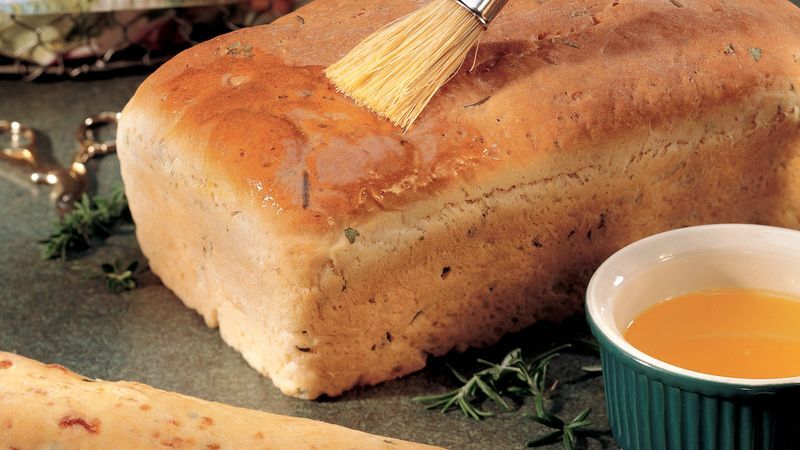 Grease bottom and sides of 9x5-inch loaf pan with shortening or cooking spray. In large bowl, mix 2 cups of the flour, the sugar, salt and yeast. Add water, parsley, shortening, rosemary and thyme. Beat with electric mixer on low speed 1 minute, scraping bowl frequently. Beat on medium speed 1 minute, scraping bowl frequently. Stir in remaining 1 cup flour until completely mixed. Smooth and pat batter into pan, using floured hands. Cover; let rise in warm place about 40 minutes or until dough has doubled in size. Heat oven to 375°F. Bake 40 to 45 minutes or until loaf sounds hollow when tapped; remove from pan to cooling rack. Brush loaf with butter; cool. For great yeast bread results, try these Betty Crocker Gold Medal® flour varieties: Gold Medal® Better for Bread™ flour and Gold Medal® whole wheat flour. Batter breads are yeast breads made by mixing (but not kneading) dough. Batter breads are coarser in texture than kneaded breads and usually have only one rise time.